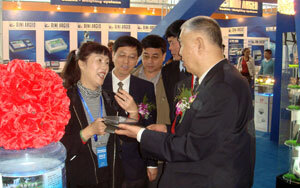 On April 22-24, 2008 the 2008China International Weighing Instrument Exhibition (InterWeighing2008) was held in Qingdao International Convention Center. Over 250 exhibitors from United States, Canada, Brazil, Germany, Switzerland, Italy, Spain, Australia, Japan, Korea, Thailand, India and Mainland China including Taiwan and Hong Kong enthusiastically participated in this exhibition. The exhibition area for InterWeghing2008 was more than 15,000 square meters, and more than half of them were the custom-built booths. During the fair period, the Council meeting for China Weighing Instrument Association, and the seminars for weighing new technology and new products were convened. The metrology experts from the National Institute of Metrology P.R.China, from the National Weights and Measures Laboratory (UK), from the Laboratoire national de metrologie et d'essais (France) and the Nederlands Meetinstituut visited the exhibition, and were present at the seminar and made speeches for some hot point of weighing instrument. For InterWeighing2008, the organizer meticulously published <2008China Weighing Instrument Guide> (Exhibitors List) and <Weighing Technology>. <2008China Weighing Instrument Guide> give in English and Chinese a detailed introduction of all exhibitors and their products. <Weighing Technology> was covered 176 pages by 34 latest papers written by technical experts in weighing field. These papers have high practical value and reference and win the warm welcome from exhibitors and visitors. The InterWeighing2008 displayed new products, new technologies, a variety of non-automatic weighing instruments, automatic weighing instruments, scales, balance, load cell, indicator, weighing system, testing instrument and device, electronic component and materials used in weighing instrument, which basically reflects new fruits of the development of international weighing industry. The exhibition attracted much concern from many users of weighing instrument. Some business people from metallurgical, chemical, machinery, transport, food, oil and other industries who use weighing instrument visited the exhibition in succession, and done the trade. In order to accelerate the pace of development, some weighing enterprises sent their staff to the exhibition for visit and study, experiences exchange and cooperation. During the exhibition many exhibitors and customers signed contracts, expressing satisfaction of participating in this exhibition. The exhibition produced a real effect in performing technical exchanges and pushing the products to the markets. They felt they are much benefited from it, and showed the wish to attend the next exhibition. They hoped the organizer could put the exhibition into a world-class level of international professional exhibition. Since 1995, all the International Weighing Exhibitions organized by China Weighing Instrument Association made a tremendous contribution to the promotion of the development of the weighing industry; strengthen the inter-enterprise exchanges and cooperation. Meanwhile, these exhibitions were conducive to the promotion of China's foreign trade development and the expansion of the exports of China's weighing products. At present, China's annual exports increase at a double-digit growth rate. In 2007 the exports sum has reached 654 million US$, increasing by 19.56% than last year. The InterWeighing2008 closed successfully. China Weighing Instrument Association will actively make preparations for the Interweighing2009. We believe, under strong support and active co-operation from CWIA members and weighing enterprises, China International Weighing Instrument Exhibition will be done more successfully. The InterWeighing2009 will be held in Shanghai, China on May 7th-9th, 2009. If you would like to be an exhibitor, please apply for booths from 2008 September 15th.